This is the only signal left standing from the days of the Puffing Billy, running from the Mainland onto Hayling Island, at Langstone. I don't know what it is, but I like the way you've captured the shadow coming off of it. I guess it is on a lean Stewart! A very good shot and a memory of the old steam trains. It's really a pity they are no longer around. I am old enough to remember them and rode on them. It was very windy that day Jan.
We have a couple still running here. I rode one a few years ago on a backpacking trip. 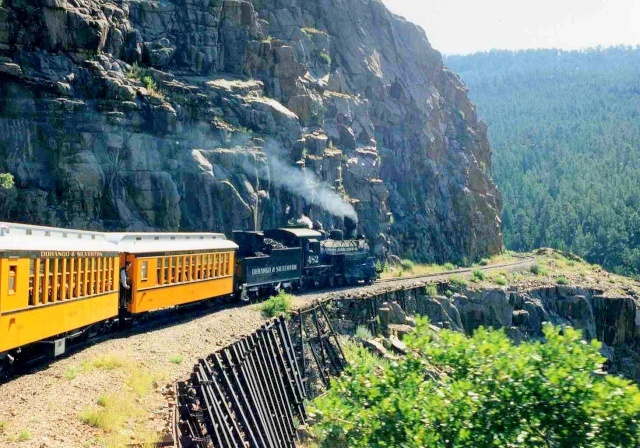 The train runs between Durango and Silverton. It stops about half way at the trailhead to Chicago Basin. Very interesting shot Stewart. Great lighting. A little close....Too Bloody close if you ask me.